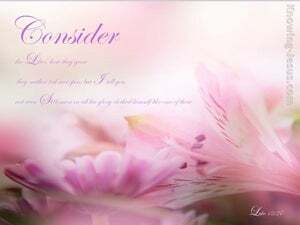 ﻿ Luke 12:27 Give thought to the flowers: they do no work, they make no thread; and still I say to you, Even Solomon, in all his glory, was not clothed like one of these. "Consider how the wildflowers grow: they don't labor or spin thread. Yet I tell you, not even Solomon in all his splendor was adorned like one of these! 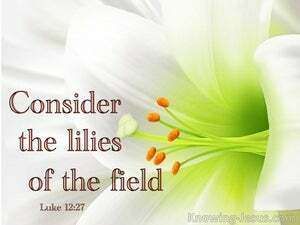 Consider how the lilies grow. They don't work or spin yarn, but I tell you that not even Solomon in all his splendor was clothed like one of them. Consider the lilies, how they grow. They toil not, nor do they spin, and I say to you, not even Solomon in all his glory was arrayed like one of these. Consider the lilies, how they grow. They neither [wearily] toil nor spin nor weave; yet I tell you, even Solomon in all his glory (his splendor and magnificence) was not arrayed like one of these. "Consider how [wild] lilies grow; they do not work or weave, yet I tell you, even Solomon, clothed in his very finest royal robes, was never dressed [as luxuriously] as one of these [flowers]. Consider the lilies, how they grow. They toil not, they spin not; yet I say to you, that Solomon in all his glory was not clothed like one of these. Consider the lilies, how they grow; they neither toil nor spin; yet I tell you, even Solomon in all his glory was not arrayed like one of these. consider the lillys how they grow: they neither toil nor spin: and yet, I tell you, that Solomon in all his glory was not arrayed like one of these. Observe the lilies, how they toil not, neither do they spin: and I say unto you, That Solomon in all his glory was not arrayed as one of these. See how the lilies grow. They do not toil or spin, but, I tell you, even Solomon in all his splendor was never dressed like one of them. Consider the lilies, how they grow; they toil not, neither do they spin; and yet I say to you, that Solomon in all his glory was not arrayed like one of these. Consider the lilies how they grow: they toil not, they spin not; and yet I say unto you that Solomon in all his glory was not arrayed like one of these. Consider the white lilies, how they grow; they are not wearied, neither do they spin; and I say to you, neither was Solomon in all his glory clothed as one of these. Consider the lilies, how they grow: they do not toil or spin, but I say to you, not even Solomon in all his glory was dressed like one of these. 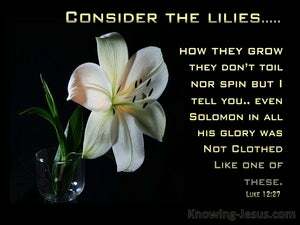 Consider the lilies, how they grow; they do not toil, they do not spin. And yet I say to you that Solomon in all his glory was not arrayed like one of these. Consider the lilies, how they grow. They labor not. They spin not. And yet I say unto you, that Solomon in all this royalty was not clothed like to one of these. Look how the lilies neither spin nor weave; and yet, I tell you, even Solomon in all his grandeur was never robed like one of them. "Consider the lilies how they grow! They toil not, neither do they spin, yet I say to you that even Solomon in all his glory was not arrayed like one of these. Consider how the flowers grow; they do not work or spin. Yet I tell you, not even Solomon in all his glory was clothed like one of these! Consider the lilies, how they grow. They do not toil, neither do they spin; yet I tell you, even Solomon in all his glory was not arrayed like one of these. Consider the lilies, that they neither spin nor weave; and yet I say to you, Not even Solomon in all his glory was arrayed like one of these. Consider the lilies; how they neither spin nor weave; but I tell you that Solomon in all his glory was not arrayed like one of them. 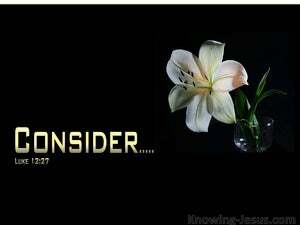 Consider well the lilies, how they grow: they toil not, neither do they spin, and yet I say unto you - Not even Solomon, in all his glory, was arrayed like one of these. Observe the lillies how they grow up, they toil not, nor spin; but I tell you, that Solomon in all his glory, was not arrayed like one of these. Think of the lilies, and how they grow. They neither toil nor spin; yet, I tell you, even Solomon in all his splendor was not robed like one of these. Just think of how the lilies grow. They do not toil nor spin. But, I tell you, not even Solomon, in all his splendor, was ever dressed like one of them. Consider the lilies, how they grow; they neither toil nor spin; and I say to you, even Solomon, in all his glory, was not arrayed as one of these! Consider the lilies, how they grow; they toil not, neither do they spin: and yet I tell you, that even Solomon in all his glory was not arrayed like one of these. 26 If, then, you are not able to do even that which is least, why are you troubled about the rest? 27 Give thought to the flowers: they do no work, they make no thread; and still I say to you, Even Solomon, in all his glory, was not clothed like one of these. 28 But if God gives such clothing to the grass in the field, which today is living, and tomorrow will be burned in the oven, how much more will he give clothing to you, O men of little faith? Now the queen of Sheba, hearing great things of Solomon, came to put his wisdom to the test with hard questions. Now the queen of Sheba, hearing great things of Solomon, came to Jerusalem to put his wisdom to the test with hard questions; and with her came a very great train, and camels weighted down with spices, and great stores of gold and jewels: and when she came to Solomon she had talk with him of everything in her mind. Give thought to the ravens; they do not put seeds into the earth, or get together grain; they have no store-houses or buildings; and God gives them their food: of how much greater value are you than the birds! But the man of wealth, that he is made low; because like the flower of the grass he will come to his end.